Robert joined the School of Law as a lecturer in September 2014. Before then Robert studied at Durham Law School, graduating with a LLB (Hons) in 2008, a MJur in 2011, and a PhD in 2014. In 2016, Robert became a Fellow of the Higher Education Academy (FHEA). Robert is a leading researcher in UK Public Law and his work has been published in Public Law, the Modern Law Review and the Edinburgh Law Review. 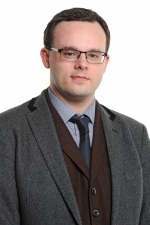 Robert’s research interests lie in the realm of UK Public Law, in particular legal and political constitutionalism, devolution, parliamentary sovereignty, government accountability, and constitutional conventions. His work challenges the assertion that the British constitution is undergoing a fundamental transformation from a political to a legal constitution by proposing and providing evidence of a new reconciliatory theory of constitutionalism: complementary constitutionalism. Robert has published in leading law journals including Public Law, the Modern Law Review and the Edinburgh Law Review. He would be interested in supervising students in the field of UK Public Law.